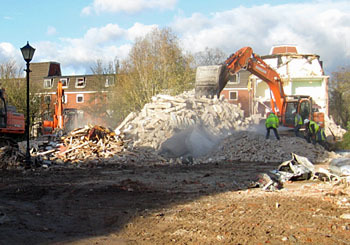 Demolition work has begun on Bootham Park Court, the nurses’ accommodation alongside Bootham Park hospital. I can remember these houses and flats being occupied, but they’ve been empty and boarded up for some years now. Like all empty buildings they’ve been the subject of letters to the local press. They date from the late 1970s, apparently. They’re not beautiful in any way – in fact they’re probably the most boring buildings I’ve ever taken photos of. I did take a photo of them before demolition began, but it was too boring to include. I apologise about the boringness of these, but this demolition deserves recording, because 1) it’s rather controversial and 2) a lot of people must have lived here over the years, and there will be people who had happy or significant times in these buildings now being reduced to rubble. Discussions did take place about the possibility of bringing the accommodation back into use. I’ve just read through the planning application information and, assuming it’s an objective representation of the facts, I can see why this wasn’t feasible. We have homeless families needing accommodation, but we can’t just take the boards off the boarded up windows and say ‘here you go then, live here’. It would be nice perhaps if it were that simple, but it ain’t. 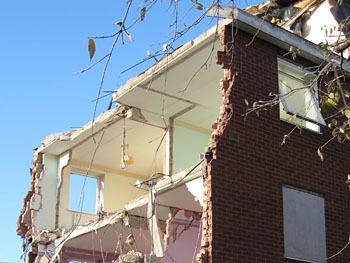 It would take £5-8 million to refurbish the buildings to the standard required. Not really worth it, is it. They’re NHS buildings, and the NHS no longer has a need for this kind of on-site accommodation. Which is why they’ve been left empty. The land they’re on is right next to Bootham Park (psychiatric) hospital, and just across the narrow lane behind them is our main general hospital. So this soon to be cleared area is in a very convenient location for new health service facilities, which will be built here at some point in the coming years. Yes, it’s a waste of resources to pull down relatively new buildings, but then we’re always wasting resources. We seem to have a fair few late-20th century buildings which ended up being not fit for purpose rather rapidly: the ‘Splash Palace’ toilet block and the Peasholme Centre spring to mind. Both also cleared out of the way in recent years. It remains to be seen whether the vast number of apartments constructed during our recent building boom are fit for purpose in a decade or two. 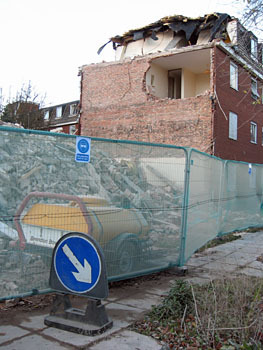 Meanwhile, comments are welcome on Bootham Park Court and its demolition, particularly from anyone who lived here. City council planning: Bootham Park Court Residences – planning application approved, re demolition. The Design and Heritage statement (PDF) has the main information. I was interested in starting a community project to get these occupied again, but the demolision guys beat me to it. Apparently there was asbestos in them, I heard later. I had another idea though. Hospital meals are terrible and low in nutrition so these large empty spaces, now all wild plants, could become a community food growing project for the hospital. Maybe even rescue chickens could have a massive run in one. This would also create beautiful spaces for patients under Bootham hospital to relax in, and they may even find tending chickens and gardening therapeutic. At the same time it would supply the 2 hospitals with fresh food. Anyway, I plan to suggest this to edible york, and see also what the long-term plans for these spaces are, and what the ground is like. That is a brilliant idea, Jenny. Since the demolition the whole area has been surrounded by temporary fencing, partly I guess because the contractors doing work on the adjacent Union Terrace have needed some of it, and there’s car park on some of it, but the rest is just weedy nothingness punctuated by trees. Somewhere in the middle is a rose bush I noticed was blooming beautifully this summer but no one could smell it as the fences kept us out. A complete waste of a large area of land. Hope you can get it back into useful life as you suggest, email me via the contact link if you think I can help. I trained as a Staff Nurse at York District Hospital 30 years ago and have very happy memories of living in Flat D24 alongside 3 other student nurses. The flats were an amazing first home and integral to our life at YDH during our training. I work for the hospital now and it’s strange to see the site of the flats no longer in existence. I agree they were no architectural feast upon the eyes, but they were home to many thousands of student nurses over the years. Happy times. I have no photos of the nurses flats from my time there… wish I had… it’s a void in my memory! Please fee free to email any photos of the before, during and after… a trip down memory lane! I lived there whilst training to be a nurse- now retired! I have such happy memories of the flat- my fellow flat mates are still good friends ! We were the first batch of students to live there in 1977 and it was all spanking brand new! We loved it- subsidised accommodation next to the hospital and a short walk from the pubs! Wonderful memories- I was sad to hear of it’s demise. Very sad! They were brand spanking new when I lived there. From 1978 to 1981. They were lovely flats for nurses (and for Doctors and their families as well). Not only was it subsidised and walking distance from the hospital but we had great parties in the common rooms on the ground floor. And that was when the design fault with the “quadrangle” of flats was discovered – the noise bounced off the walls round the quadrangle and kept everyone awake. Simple solution – get up and just go to the party! Ear plugs were handy as well. We were on the top floor and had an amazing view across York. My main memory is of the fire alarms going off when people came in late and made toast. The smoke detectors were over sensitive. Each time it was set off the fire brigade had to come out and we all had to evacuate the building until it had been checked – usually in the middle of the night and sometimes twice in one night! But such a shame! The 1970s is that old for accommodation. How sad nurses no longer live together when training. I hope they build something just as nice there. That should say ISN’T that old for a building.